GHA Group is one of London’s most experienced full-service audio visual communications companies. Based in the capital’s West End, it has provided event staging, Audio Visual Hire, AV systems design and installation and special projects for almost four decades. Challenge: New London Architecture (NLA) wanted to create a huge model of London that would use projection to show the city’s growth over the last two millennia and planned future developments. The ceiling in the room is low and the whole model needed to be covered with no more than eight projectors. Solution: Model makers, Pipers, created the 1:2,000 scale New London Model and GHA installed eight Optoma ProScene EH505 projectors with short throw lenses to project down onto the model. A tvONE CORIOmaster Mini C3-510 blended the output from the eight projectors. They had to use the widest lens possible and install three of the projectors in landscape mode and five in portrait. 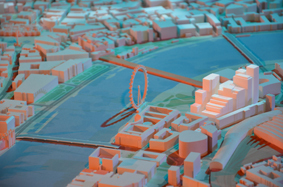 New London Architecture (NLA) wanted to create a huge model of London that shows its iconic skyline, reveals the capital's planned developments and demonstrates graphically how the city has changed over the last two millennia. The New London Model would be its flagship exhibition at NLA Galleries at The Building Centre. The first roads in London were laid 2,000 years ago. Since then it has grown to be one of the most densely populated cities in the World. NLA wanted to demonstrate this growth and show future developments planned across the capital. NLA already had an app on its website that it wanted to use as the basis for an interactive feature on the model allowing visitors to search and see planned developments across the city. NLA commissioned model makers, Pipers to construct the model for this ambitious project and appointed AV experts, GHA Group, to oversee the projection system that would plot the city’s underground lines, highlight the boundaries of its boroughs and the City of London, and reveal how these administrative boundaries have changed over time. GHA also needed to make the existing app work with the projection system. Covering a city the size of London, even at a very small scale, meant creating a very large model. The ceiling in the room is unfortunately low and GHA needed to cover the whole of the model with no more than eight projectors to keep within its budget. The short distance from the projectors to the model meant that the widest possible angle lens was needed to cover the whole model, that the projectors needed to be carefully set up and aligned and that edge blends between the projectors were kept to an absolute minimum. 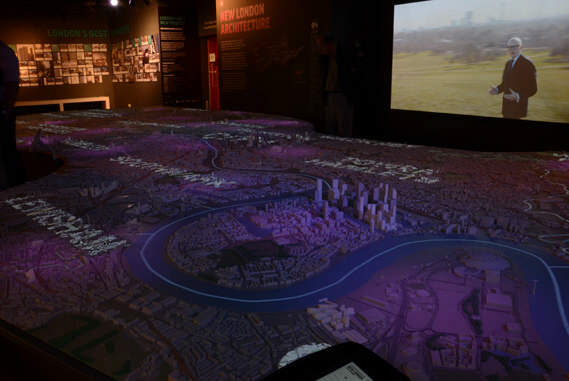 Pipers, used Ordnance Survey's 'height and footprint' digital building data to create the 1:2,000 scale New London Model. This took four months to build and was created by 3D printing and laser cutting. 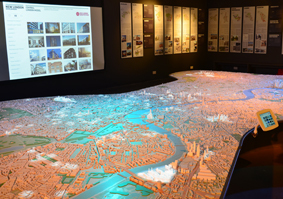 This impressive model includes 170,000 buildings and covers 33 square miles (85 sq km) of London from Old Oak Common in the west to Royal Docks in the east, Nine Elms in the south to King's Cross and the site of London's 2012 Olympics in the north. It features 19 out of the 32 city boroughs, plus the City of London and includes 34km of the Thames with 21 of its bridges. It is 12 metres long, has a perimeter of 32 metres and consists more than 60 interlocking pieces. GHA installed eight Optoma ProScene EH505 projectors with short throw lenses to project down onto the model together with a tvONE CORIOmaster Mini C3-510 to blend the output from the eight projectors. To cover the entire model they needed to use the widest lens possible and install three of the projectors in landscape mode and five in portrait. They are installed at an angle of seven degrees to the axis of the model to provide the fullest possible coverage and the overlap between the projectors is very small indeed in many areas. It chose this 5,000-lumen projector due to its multiple lens options, including the unusual short throw off-axis option, used for this project, its throw ratio of 0.77:1 and its WUXGA resolution – all of which were essential to achieve the projection coverage across the model. As the imagery from the eight projectors was to be edge blended, its powerful image blending tools and reliability were factors, as was the fact that it was available in black which would be unobtrusive in the dark ceiling. The tvONE CORIOmaster Mini video wall processor provides eight outputs connected to the projectors to create the video scaling and the edge blend and create one, large, seamless image. Using tvONE CORIOgrapher software, the individual image projected by each projector can be easily aligned. The brightness and the gamma in each of the crossover areas are adjusted to match the surrounding image perfectly. One of the reasons GHA chose the tvONE CORIOmaster was that it allowed the team to edge blend multiple projectors installed in different orientations. From an optical perspective, the model was split into four 1920 x 1280 screens. The video was distributed across four HD inputs and each was divided between two projectors – which might be both portrait or portrait and landscape. Andy Ince, Chief Engineer at GHA, said: “The overlap on the edge blends is incredibly small, leaving no room for error. We planned the projection out on CAD before installing the projectors and knew how challenging it would be to cover the whole model with eight projectors. “We chose Optoma’s EH505 because it had this flexibility to install in either orientation and had the multiple lens options including the off-axis short throw lens. We had to install the projectors in both orientations and even rotated one to achieve this coverage. 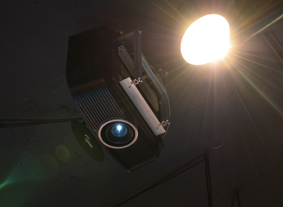 A ninth EH505 projector was installed with a standard throw lens to show films on a 3 metre wide central screen above the model that tells the story of London's development. On the hour, every hour, a series of five films are shown on the main screen narrated by Peter Murray, Chairman of NLA and expert on the built environment. These films are synchronised with projection onto the model. For example, as the film talks about the growth of the underground lines or the spread of the Great Fire of London in 1666, these are shown snaking and unfurling across the model. 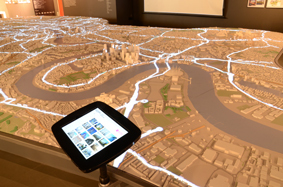 When the film is not running the central interactive iPad allows visitors to search developments across the city. The projection on the central screen mirrors this device for all visitors to see the results. The geographic locations of the developments shown on the iPad and screen are projected onto the model. There are four other iPads around the model that are installed with the same app but these are not linked to the projection system. To install the projectors GHA built a six metre wide gantry that spans the width of model and allows the team to work above it. This is cleverly stowed away in a purpose-built cupboard under the model when not in use. The projectors are run all day on Eco mode. They are networked into a control system using Python that switches off the projectors every evening. The whole system is operated from two computers in a discrete control room that forms part of the wider exhibition in which the model is set. All Optoma projectors use DLP technology, pioneered by Texas Instruments. This uses millions of mirrors to produce high quality imagery which does not suffer colour degradation over time, as sometimes experienced in other projector technologies. The dust-sealed, filter free design prevents dust and dirt from affecting the system ensuring optimal image quality with minimal maintenance. This provides ultimate reliability in its 24/7 operation. With full support for Crestron, Extron, AMX, PJ-Link and Telnet LAN commands, the projector can be controlled and monitored remotely over a LAN. CORIOmaster offers a new, more efficient approach to edge blending and videowall systems. Using tvONE CORIO®3 technology gives installers the ability to create creative and dynamic displays. The display was opened to the public at the NLA galleries at The Building Centre in London in April 2015. Roddy Gye, Managing Director of the GHA Group, said: “We are delighted with how it looks and works. It has been a real hit with the architectural world and NLA love it. 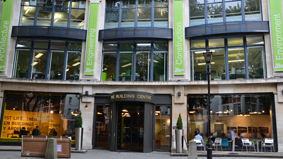 The New London Model will continue to be updated with projects that have planning permission or are under construction. This includes Crossrail and the upgrade of London Bridge Station, which are under construction, and future projects such as Crossrail 2 and High Speed 2. It also extends out to Earl's Court and White City - both major areas of proposed change. 9 black ProScene EH505 projectors, 8 short throw lenses, 1 standard lens, 1 tvONE CORIOmaster Mini C3-510 video wall processor.